Caflon 24 carat gold plated surgical steel 3mm, 4mm and 5mm ball stud earrings with matching butterfly backs. 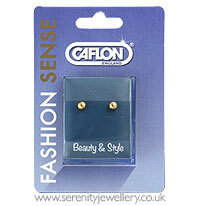 Caflon Fashion Sense earrings come in sealed sterilsed packaging. 24 carat gold is 99.9% pure. Gold that is less than 24 carat is an alloy and it is the other metals in the alloy that usually cause allergic reactions to gold earrings. 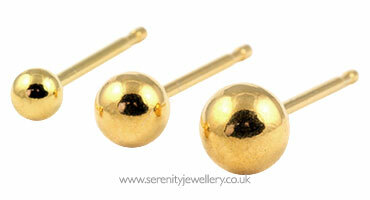 Gold is used as a plating on surgical steel as it is too soft to use on it's own. 316L surgical steel is hypoallergenic but does contain a small amount of nickel. 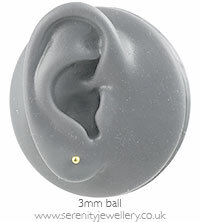 The nickel release rate is only around 0.02μg/cm2/week (without the 24ct gold plating) but it may cause a problem if you are very sensitive to nickel.